Luxury Living's Sales Director, Ian Gray showcasing the Aqua Samui and Aqua Residence awards at the Asia-Pacific Property Awards 2014-15. Luxury Living was very proud to accept the Best Architecture award, 2014 in the Multiple Residences, Thailand category for its Aqua Samui villa development on Koh Samui. 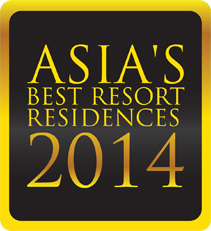 Aqua Samui by Luxury Living was very pleased to accept the award for Asia's Best Resort Residences, 2014 following on from winning the same award in 2013.